A new study published in STEM CELLS, conducted by researchers at the University of Amsterdam, shows how mesenchymal stem cells (MSCs) have multiple immune modulatory properties that could benefit the treatment of sepsis. This study also examines the importance of how MSCs affect inflammatory responses in humans. Sepsis is a complication caused by the body's overwhelming response to infection and can lead to organ failure. It is a major cause of morbidity and mortality worldwide. Despite the use of antibiotics and well-quipped intensive care facilities, sepsis kills about one in every four patients who contract it. Studies done on animals have shown that treating sepsis with MSCs can reduce the mortality rate by as much as 73 percent. Whether humans might realize the same benefits remains a question. The University of Amsterdam research team sought to answer this. Thirty-two healthy volunteers were each given a dose of lipopolysaccharide (LPS) to induce endotoxemia, a form of bacterial inflammation that exhibits some of the characteristics of sepsis and, thus, is used as a model for the condition. One hour earlier, each subject had also been given an infusion of either allogeneic adipose mesenchymal stem cells (ACSs), which are stem cells collected from fat tissue, or a placebo as a control. Those receiving the ASCs were divided into three groups, with each group receiving a consecutively higher dose of cells. 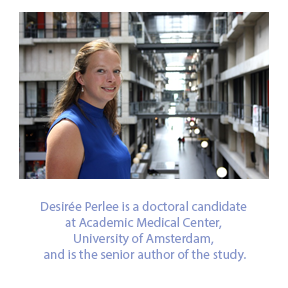 Desirée Perlee, a doctoral candidate in UA’s Academic Medical Center, was senior author of the study. “The results showed that the ASCs were well tolerated and, at the highest dose tested, associated with time-dependent proinflammatory and anti-inflammatory effects, as well as mild pro-coagulant features,” she reported. “We realize that there is a limitation with the endotoxemia model. Although in a qualitative way it resembles responses seen in patients with sepsis, it differs in that sepsis-associated alterations are more severe and sustained, while in the endotoxemia model responses occur in a very rapid, short-lived and transient way. But despite these limitations, some of our findings confirm the earlier studies on animals,” she said. Dr. Jan Nolta, Editor-in-Chief of STEM CELLS, said, “This novel clinical trial provides important insight into the mechanism of action of MSCs in inflammation and provides human safety data in support of treatment of sepsis using MSCs.